Fashion | Beauty | Body Positivity | Lifestyle | Pop Culture: Dare To Bare With FASTRACK Bags. When I started my blogging journey never in my wildest dreams did I think that at one point I would be the only Bombay based blogger to be invited to attend an event organised by one of India's leading youth accessories brand- Fastrack. And yet, who in their right mind would miss out on such a wonderful opportunity. Along with attending the ‘Dare To Bare’ collection launch fashion show, I also had an opportunity to interact with Ronnie Talati the Vice President & Business Head of Fastrack & New Brands. After speaking with Marketing Head, Simeran Bhasin and Retail Operations & PR Head, Hemal Panchamia I finally have a better understanding of the brand as well as its latest collection. Fastrack, the unconventional fashion brand has managed to established itself as 'India's leading youth accessories brand', chose to unveiled its latest range of 'Fashion Backpacks' at the F Bar and Kitchen in Bengaluru. With a strong belief that backpacks aren't always just about carrying things around, this season Fastrack is showing us the most stylish way to move with the launch of their new collection of backpacks. The latest collection of backpacks is a perfect combination of the function and fashion and is all set to spice up your wardrobe. The latest collection of backpacks come with ergonomic back support and well organized interiors. Plus, the unique materials and eye catching prints are sure to make you want to garb one for yourself. 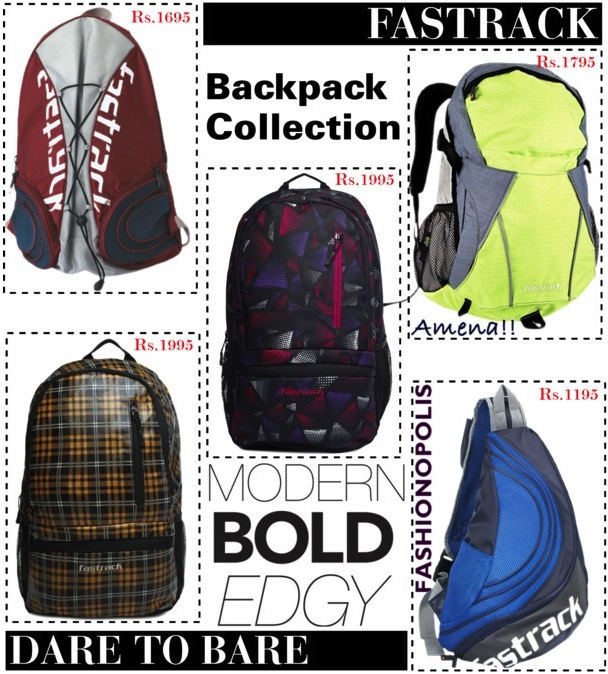 The latest collection of Fastrack has so many stylish and trendy backpacks to chose from, I just had to share with you all some of my favourite pieces. The traditional backpack has been given a stylish makeover. No more an old- fashioned, monochromatic, simple utility piece, it has been transformed into a must have accessory. From different shapes to bold prints and bright colours, these backpacks are a perfect combination of fashion and function. Even though Fastrack is a leading youth brand, the variety of bags and backpacks are for those not only young in age but also young at heart. The diversity of style, fabric and colour is bound to appeal to anyone who is, “Bold, stylish, casual and lots of fun”. Keeping its target audience in mind the bags and backpacks have been reasonably priced. 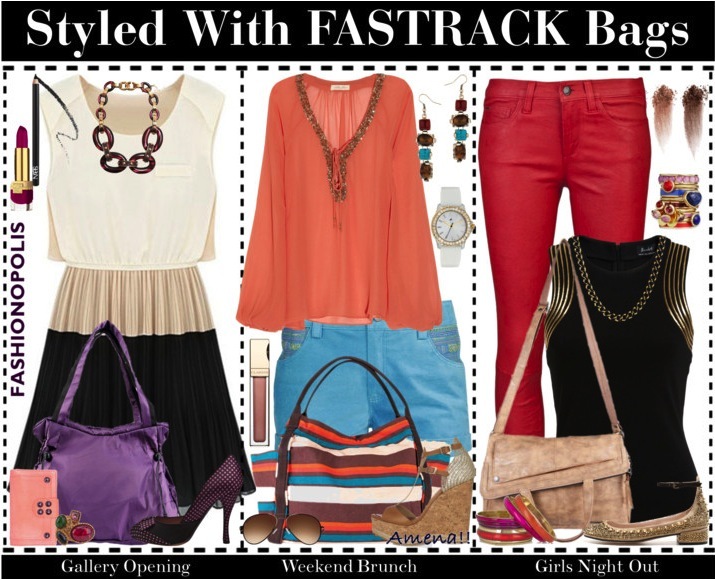 Other than trendy backpacks and bags for men, Fastrack also offers a stylish 'Girl’s Collection'. Unique metallic details, vibrant hues and extended utility makes them a must have this season. Small enough to be carried anywhere and big enough to hold all your essentials. Speaking about the collection, Ronnie Talati had wisely said: “Fastrack backpacks combine high fashion with function and will form an integral part of any youngster's wardrobe.” That is exactly what the latest 'Dare to Bare' collection is all about. Not only did I have a wonderful time at the event but also a better knowledge and understanding of the Fastrack brand. After viewing its latest collection first-hand I can't help but agree that Fastrack is 'India's leading youth accessories brand'.